This cottage, with living space on the second floor for the view, is perfect for two couples, with two very private bedrooms, each with it's own bath. Great for families as well. Cook's kitchen with all appliances, pantry and stunning view to the ocean. Eat at the bar or the dining table. Cozy living room with gorgeous window seat. Laundry, third bath and den downstairs. 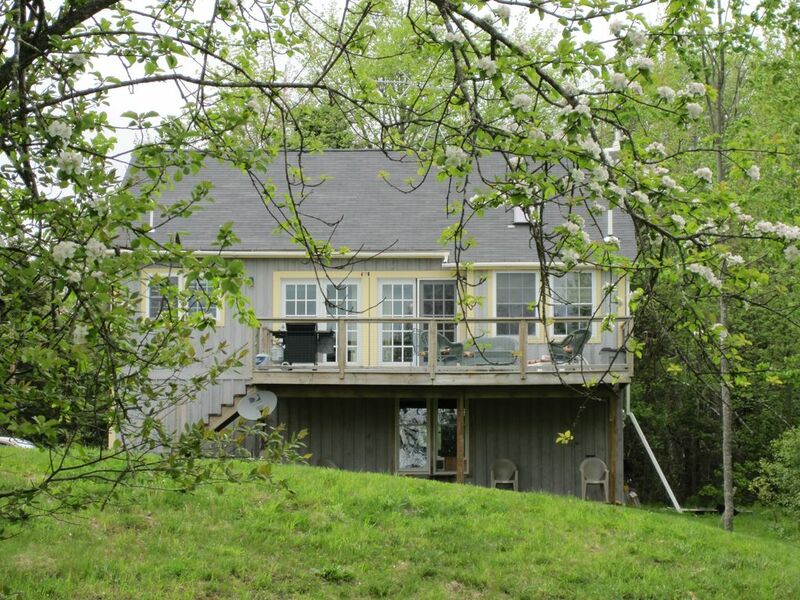 Deck across the front for outdoor living with view of Frenchman's Bay and the mountains of Mount Desert Island. Stroll down through the orchard to sit on the beach, watch the shore birds and boats go by, maybe even go for a dip if you're brave. Just 20 minutes to Acadia National Park and 25 min. to downtown Bar Harbor or 10 minutes to shopping in Ellsworth. We built this house in 2007. My husband is the carpenter and I like to decorate. We both grew up on Mount Desert Island and our parents were Islanders too. We were excited to find a property on the ocean and knew we would have to rent it in the summer to be able to afford it. We go to our camp in the summer and love sharing our house with renters, especially when they leave notes about how much they enjoyed it. Our house is well supplied with movies, games and books for at home leisure hours. There are lots of woods for walking and of coarse the beach to comb. The property was once a farm so there's an old apple orchard that attracts the deer at times. The field is big enough and at times the westerly winds are just right for kite flying. We know, we've done it! Those same breezes will keep you cool on hot afternoons as well as discourage what few mosquitoes come around. We've made a fun 'Pinecone Path' for the young at heart to explore, and have a cute little castle tucked in the trees to play in. It was perfect for us, everything was beautiful and it had everything we needed. We loved the house, the location and all the amenities. The pictures did not do justice to the quality and beauty of the home and surrounding areas. We had a terrific vacation with all there is to see and do in this location. I know this home was an import part of our great experience! We had such a nice time staying at the house. The kids LOVED the pine cone forest path down to the water. And the shoreline was so fun to explore. The house was well stocked with everything you need for a week away in Maine. Perfect homebase for exploring Mt Desert Island. Would highly recommend to anyone looking for a place to stay in this area. So happy that you had a good stay at the Gatehouse. Glad your children enjoyed the Pine Cone Path. We add little things every year, and sometimes our guests even add something! Thanks for taking the time to write a review. I can't say enough good things about this home and our time there. The location is just beautiful. We had our own private rocky beach and a beautiful grassy orchard for picnics and relaxing. We saw deer, rabbits, birds. The inside of the house is just as lovely. It is beautifully decorated, immaculately clean and has everything needed. As someone who loves to cook, I have to add that the kitchen has nice quality pots and pans, baking items and utensils, and everything needed for lobster dinners. During our week we enjoyed several days in Acadia, a rainy day in Ellsworth, and lots of meals outside. The owner was super helpful and very responsive. I hope that we will be able to return next year. I'm so happy you had a great week and enjoyed our house. Thanks for taking the time to write such a nice review. Quaint house, away from it all but convenient to everything. House was exactly as described, and served as a fantastic week-long get away for our family of four. The owner was communicative, and responsive to a minor issue we had. She even recommended 4th of July activities for us that we never would have been aware of without her local intel. Thanks so much for taking the time to wrtie a review of our home. We're so glad you had a great get-away. Our family LOVED this property and can't wait to come back. The house is much larger than the pictures show and is full of natural light and fresh air. The property is full of fun little surprises such as paths and fairy houses in the woods. It comes with everything you would want or need. We loved the privacy (no neighbors in sight) and having our own little beach (kayak and life vests to use too!). The kids loved seeing the local wildlife (deer and raccoons) wander through our yard. Lots of books and toys for any age. Jet tub in the master bath and AC unit in the master bedroom. Vicki left a wonderful book full of advice (best places to eat, nearest grocery stores, etc.) plus lots of brochures and guides for activities in the area. We felt so at home and this house truly made our vacation so special. We had originally planned on staying in Bar Harbor and I was hesitant about staying off MDI, but now I would never have it any other way. My kids (5 and 10) are already begging us for this to be our vacation house every summer! We will certainly be back. Zero negatives. Our family's experience at the Gatehouse was fantastic. The photos of the property, as nice as they are, don't really do the place justice. The house is spacious (perfect for our family of four), tastefully decorated, and there is plenty of privacy. A pleasant surprise: there's access to a quintessentially Maine rocky beach, which seems to be private--never saw another soul the week we were there. I should also add that Vicki was kind and helpful throughout the process. We had a snag with the HomeAway reservation system, and she went out of her way to accommodate us. I had worried we were a little too far away from Acadia/Bar Harbor, but that turned out not to be warranted: it's an easy, pleasant drive and it was good to be away from the hustle and congestion of Bar Harbor. Highest recommendation. If you've come to see the sights, there's plenty to do. Acadia National Park is 20 minutes away with lakes, mountains, ocean drives for walking or biking. There are rental places for bikes or kayaks, whale watches, sight-seeing cruises, lots of shops, restaurants, movie theaters, museums, a zoo, even an oceanarium. There's a fun park nearby in Trenton with a water slide, miniature golf and other attractions. We'll have brochures at the house for you to check out. Very near to us is Lamoine State Park and Lamoine Beach, one of Maine's best kept secrets, according to Down East Magazine, and we agree. It's just beautiful and gives you a breathtaking view of the mountains of Acadia across the bay.There is also Blunt's Pond nearby for swimming. $1000.-$1500. We built our house in 2007 and renters have been very haappy each year they've come. They say it's the 'perfect seaside retreat.' May 1000/week (ladyslippers in the Park) June 1000./week (lupines everywhere) July 1400./week Aug. 1700./week Sept. 1200./week Oct. 1000./week (great time to see the foliage) Sat. to Sat. $200.deposit and 8% sales tax must be added Prices are for 6 people, please check for larger groups.